Even some of Donald Trump’s supporters would probably admit that a lot of the things he does could be considered evil or villainous. Because he’s running for president, we feel a personal connection to a lot of the bad things he does here in America, but it’s easy to forget that he’s done bad things all over the world. In fact, Trump’s global villainy is so bad that a filmmaker named Anthony Baxter is making a second documentary about a specific family that Trump has repeatedly screwed over in Scotland. Much like how Lex Luthor hates Superman, Donald Trump apparently just really has it out for the Forbes family in Aberdeen, Scotland—at least according to these films. 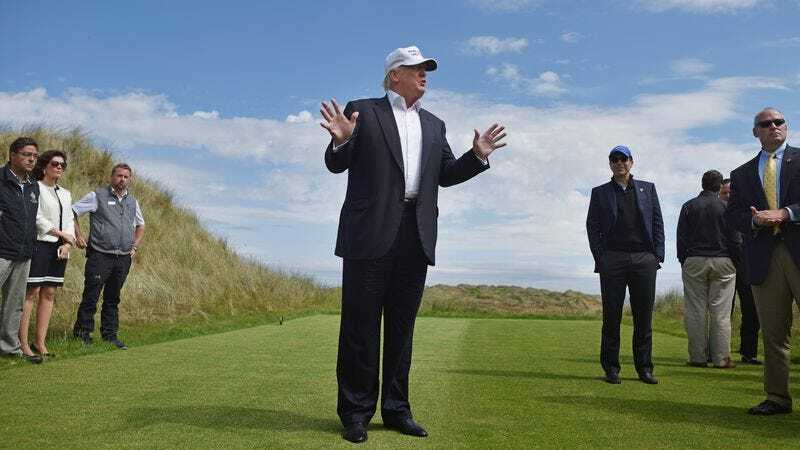 The initial film, 2011’s You’ve Been Trumped, followed the Forbes family as they refused to sell their farm to Trump so he could use their land as part of his golf resort. This new film, You’ve Been Trumped Too, catches back up with the Forbes family to discover that they still haven’t given in to Trump’s pressure, even though construction on the resort cut off their water supply five years ago and it still hasn’t been fixed. In case it’s not clear, that’s probably the point in the story where Trump crosses the line between everyday villainy and cartoonish super-villainy. Baxter is crowdfunding You’ve Been Trumped Too with a Kickstarter campaign, and he has raised over $60,000 of his $75,000 goal with nine days left. Also, in a surprising twist, this film will actually feature an interview with Trump and one of his sons trying to justify what they’re doing to this family, so if you’d like to see that, head over to the Kickstarter page for more information. This comes just on the heels of Michael Moore In TrumpLand, a documentary that sees the Bowling For Columbine filmmaker heading into Trump territory to talk about the election. While that film seems to be specifically positioned to convince third-party supporters to vote for Clinton, You’ve Been Trumped Too is apparently all about showing you just how bad Trump is.